Made of natural two tone colour slate with rippled curved water panel that sparkles under built-in lighting, with gently flowing waters providing a calming effect as it soothes and restores body, mind, and spirit. Pump and all necessary parts included for easy assembly and operation. 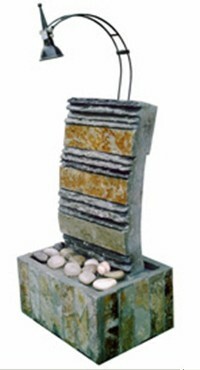 this unique fountain crafted out of natural slate stone by gifted artisans.